Taylor stumbles upon a Cherokee baby girl and decides to take care of her. I love Taylor and I love Turtle. You know, how this can happen that a writer can make you love her characters so much that you feel sorry you cannot meet them? Well, this is such a book.This second copy I picked up at Fong's bookstore the Booklet, at our meetup! One of my all-time favourite books, which I immediately started re-reading, for the fourth or the fifth time. I have lost count. Since my first copy is lost, this one is my PC. It goes to bookcrosser as an RABCK and will then be made into a ring, to end up with me again so I canreread it for the umpteenth time. To my surprise and delight, I found the book in my letterbox when I came home from a holiday in England. Thank you so much biba! This is one of those books that gripped me from the first page. I did not want to stop reading and read it in one go. Highly recommended. This copy will travel as a bookring. Bookcrosser, would you be so kind as to send it on its way? Released on Tuesday, August 24, 2004 at N/A in n/a, n/a Controlled Releases. Book will travel to Riemke. "a bookring never comes alone", and that was why I found two of them in my post box today. so plenty to read the next few weeks. thsnk biba for riningn and bookcrosser for sending it. It wasn't the fault of this book that it took me so long reading it. It's interesting, beautiful ans has a quick, humourish style. i liked it. bookcrosser already quoted the most beautiful sentence of the book. I think it's really a biba-book :-) ... that is: how I've got to know biba a little bit during the meetings. 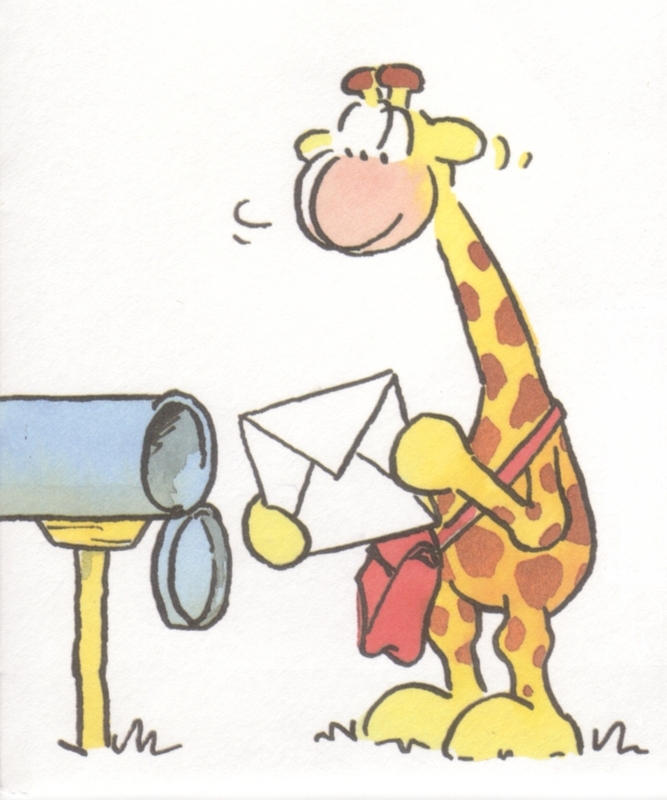 olifant is the next reader, I'll send it today! and sorry for keeping it so long. Ah, The Bean Trees, ah! Ah....love this book! It is warm and full of images. Barbara has a wonderful writing style: simple and often very funny. The book is about having no home and having a home, it’s about friendship and love, it’s about taking a risk and making the best of it. Lou Ann hid her mouth with her hand. “Nothing.” I could see perfectly well that she was smiling. Will send the book to Suzy26 tomorrow. Received this book in the mail. Can't wait to start reading, but first I have to finish another ringbook. Thanks to Olifant and Biba89 for sending c.q. ringing it. Wonderful book. Although it deals with a great number of heavy subjects (teenage pregnancy, child abuse, single motherhood, the refugee problem, American-Indians etc.etc. ), this novel never gets melodramatic. It is very much about love and friendship. Its heroine, Taylor, is tough and tender at the same time. She takes everything in her stride and has a great sense of humor. It is a comforting book with a happy ending. Here's what it said on the package: 'Please Note. Parts are included for all installations, but no installation requires all of the parts'. That's kind of my philosophy about men. I don't think there's an installation out there that could use all of my parts. Book is on its way to jgralike. Enjoy! Received the book today, I'm eager to start reading it, but there is one small and beautiful book I'm finishing first. This book just wriggled itself on top of TBR, when I read the first lines. It is indeed a touching story, and I read on and on. It is not that Taylor sees everything more simple as it is, but she describes her life as if she is just telling the story, though there is a lot of tougher stuff in it then most of us will encounter. Strange things happen, beautiful things too, I'm glad I read the book. Sending it on to Muizz, as MaaikeB already has her own copy. Found it today when I came home. First two other bookrings to read, then this one. Thank you jgralike for sending the book to me and for the nice postcard. And thanks Biba for ringing this book. As I said: never judge a book by it's cover. 'The Bean Trees' is a very special book. The story of Taylor, Turtle and their friends may be a little strange, but it is also very touching. This book is one of the best books I've read in 2004! 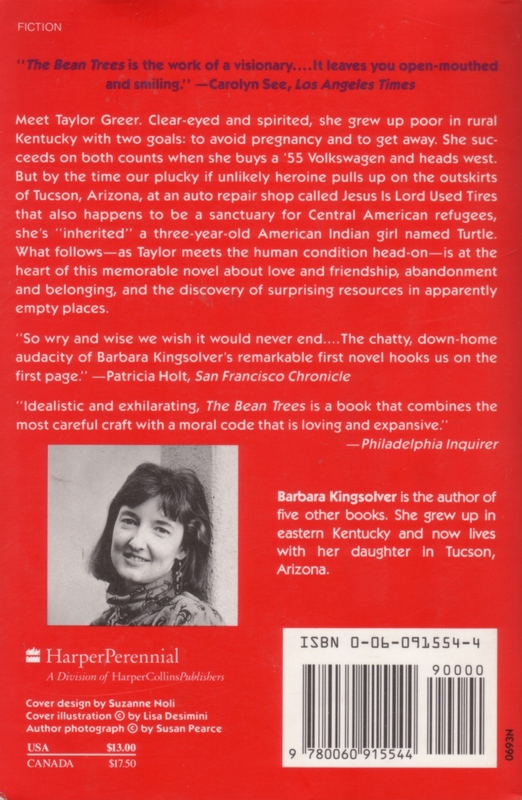 It was my introduction to Barbara Kingsolver, and I definitely want to read more of her books. Thanks, biba, for sharing your favourite book with us! I hesitated about two weeks before starting this book. Just another book about poor people travelling in an old car through the US, I thought. But no, when I started I finished it in two days, unable to put it down for a long time. Of course it is a book about terrible things, but they are written about in such a way I often had a smile on my face. Sublime characters! 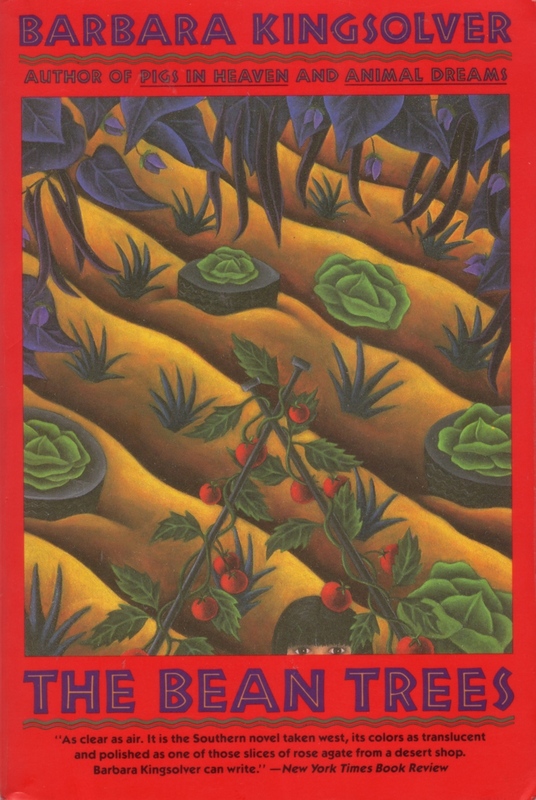 I like to read all other books Barbara Kingsolver has written (except The poisonwood bible, I have read already). Biba, thank you for ringing this book and Muizz for sending it to me. Today it leaves my house, direction Amsterdam. Maupi, here it comes! Hebbes. Dank je wel janna, 't was een verrassing. En biba voor het ringen. Wat een positieve berichten. En highly recommended door BookCrosser. Ik geloof dat ik 'm daarom wilde. Read it, enjoyed the read. But for me it isn't such a memorable book and I don't think I'll be picking up another Kingsolver soon. It has this slightly trivial, soap-like, warm 'n fuzzy, group hug and it's a small world after all quality, not quite my taste. Still, I'm glad I know that now. I've heard so much about Kingsolver, now I've actually read one of her books. I finished book on the train yesterday. It was the first book I read of this author and I found it an enjoyable introduction to her writing. She writes some very true things in this book, one of which is 'in a world as wrong as this one, all we can do is make things as right as we can' (page 220). This book confirms my belief not to judge harshly and have compassion for people around us. I will send this book to wandering who is next on the list. Back cover with description of the book and picture of the author. I'm going into town later and will mail this book then :-) Happy reading wandering! Arrived safe and sound on my doorstep today, I'm looking forward to reading it! 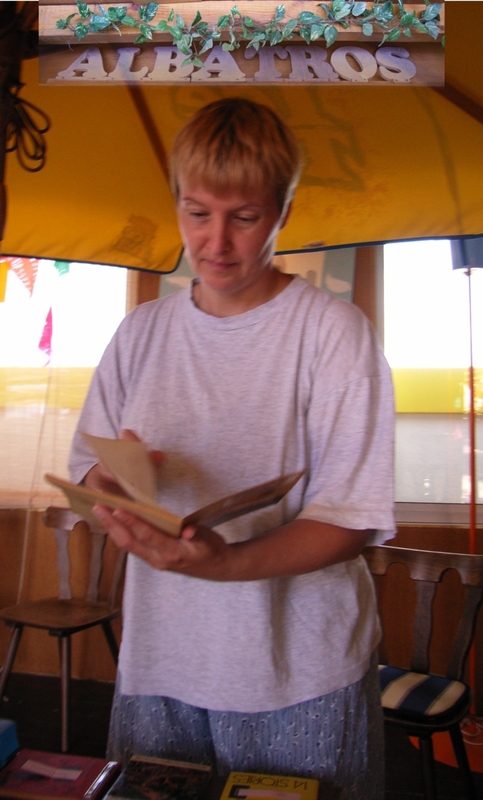 The picture of the author vaguely reminds me of my mom in her early days... funny. "I realized I had no business just assuming I could take the responsibility for a child's life." "There's not a decent mother in the world that hasn't realized that." "So how does a person make a decision that important? Whether or not they're going to do it?" Thanks for sharing, biba89! It's on its way to kriskras now... enjoy! Oops, I read The Bean Trees about two weeks ago and totally forgot to journal it, sorry! 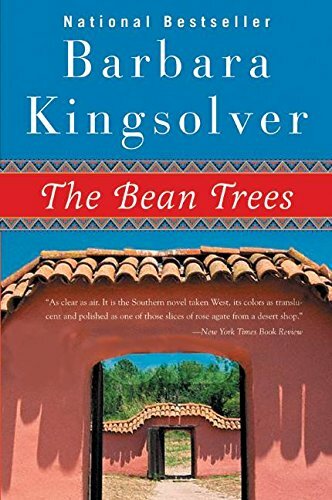 I found the book entertaining and worth reading, but it didn't turn me into a big Kingsolver fan as it left me with more or less the same feeling as it did Maupi. I'll return the book to Biba89 tomorrow. Thanks for ringing! The Bean Trees are back home, after traveling for a year. I've got another copy by now. Let's see if there are some new people interested in another ring. This lovely novel is on its way to terpsicore in Portugal in a book swap. Enjoy! Just received. Thanks for the swap, biba89! Lovely book! I t made laugh, it made me cry, and even if some horrible things happen, you close this book in a great mood. Just what I needed. And I love Barbara Kingsolver's prose. great images! I'll see if someone else wants it over here or should I mail it back to you biba? PAssed it on to my collegue B., who enjoyed it,ands I will try to "push it" at today's meetup.